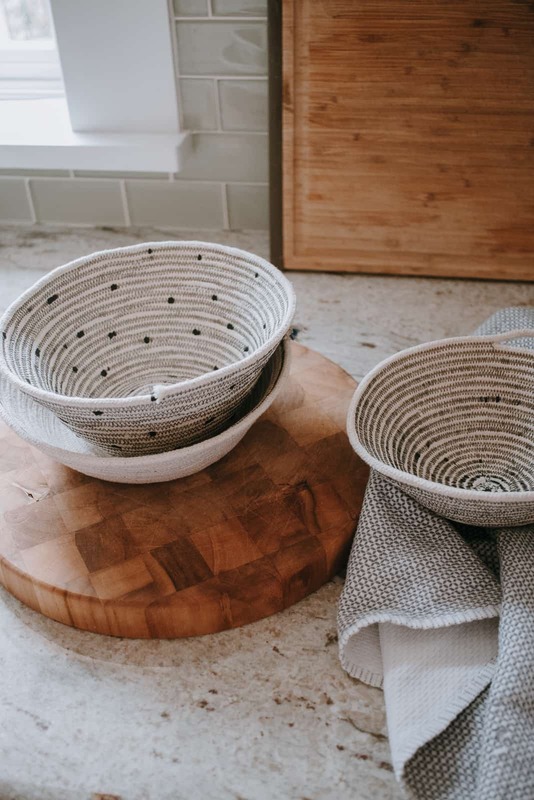 Make these stylish diy rope baskets using your sewing machine and some cotton cording or clothesline. Full Tutorial inside! 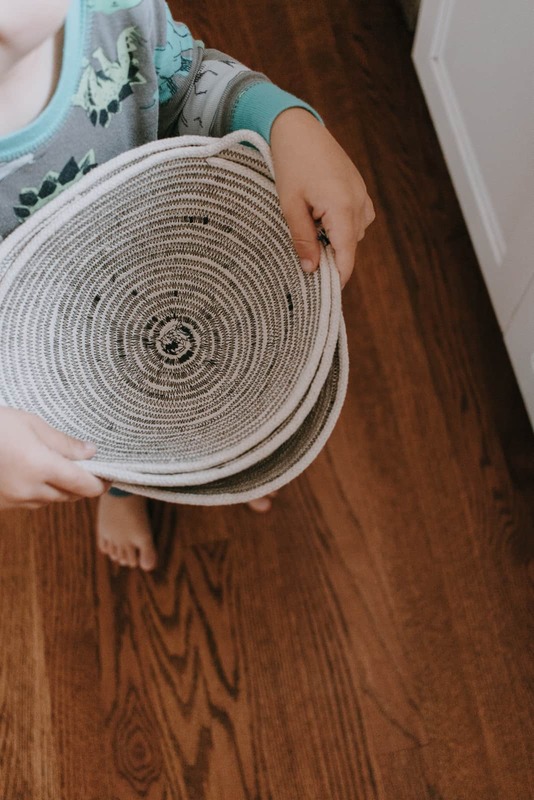 I know I say this with every project – but I’m obsessed with this one! 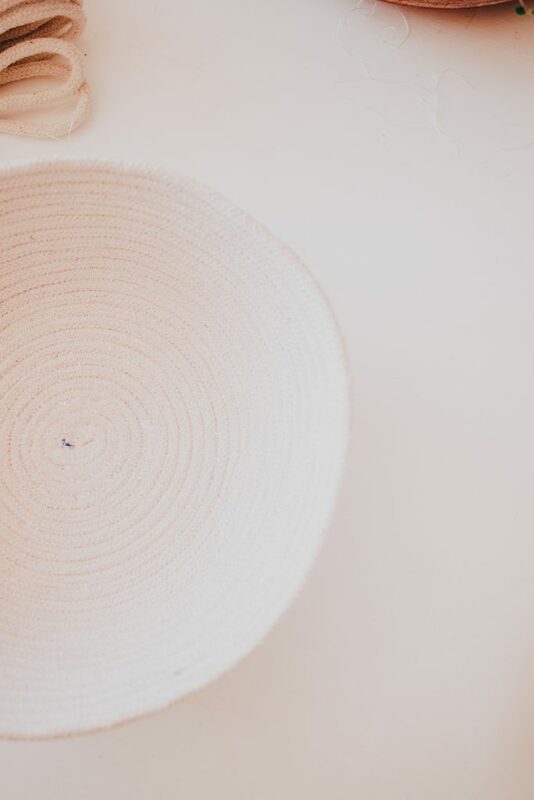 These little rope baskets are so stylish and sturdy and perfect for holding all those bits and baubles we all have. 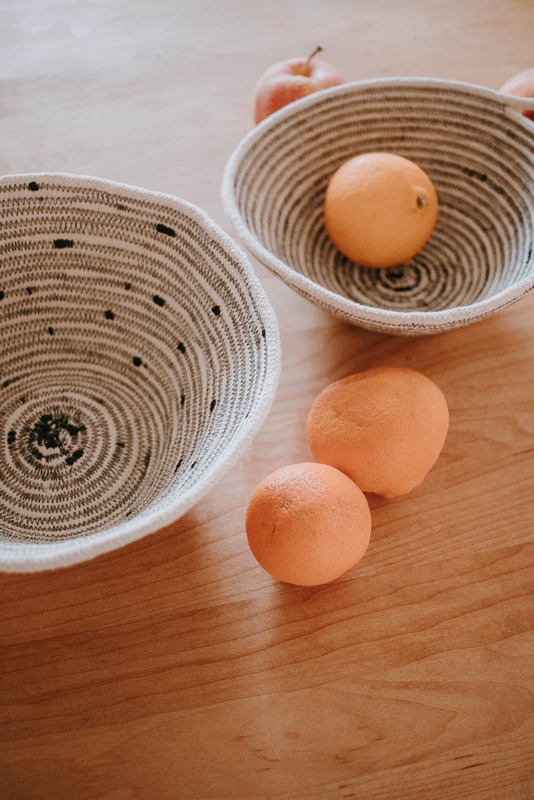 You can actually buy these rope baskets too. But, for less money, I made three good sized baskets out of inexpensive clothesline and still have a bunch leftover to make more. So you save so much money by diy’ing them yourself! And it’s a fun project to boot. 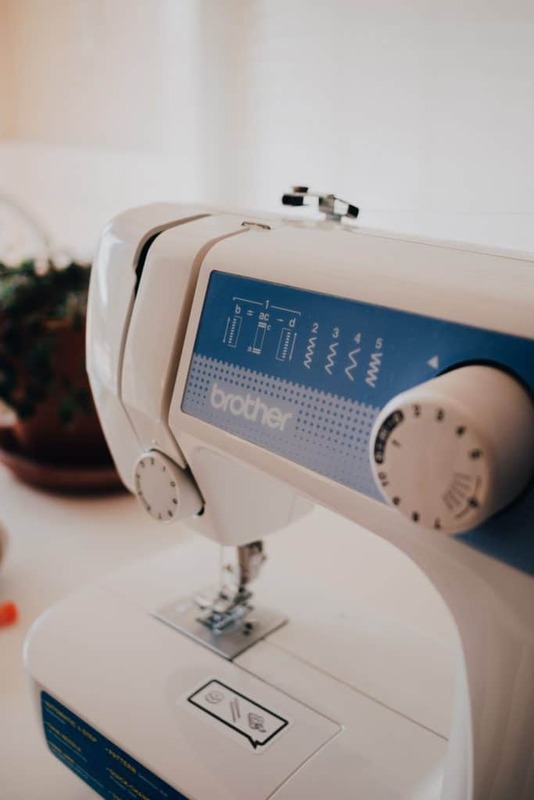 I especially love that your sewing machine does all the work for you. 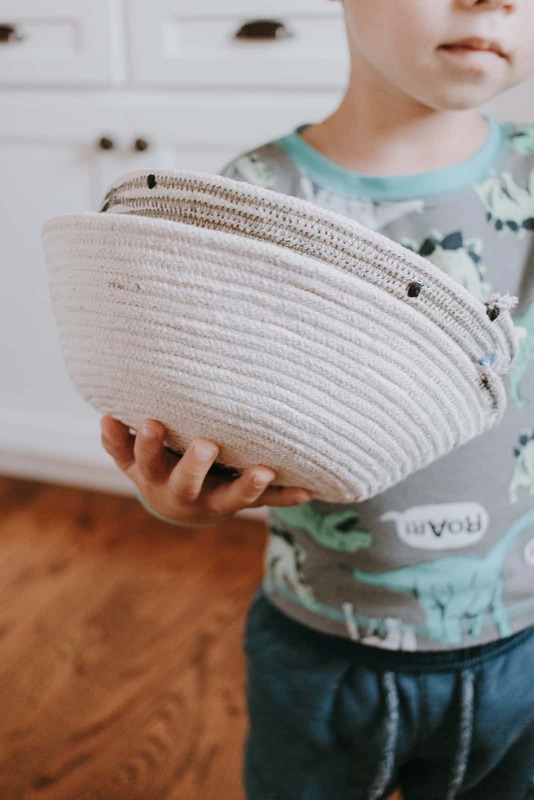 I’ve seen these rope basket tutorials using hot glue so that is an option if you don’t have a sewing machine. 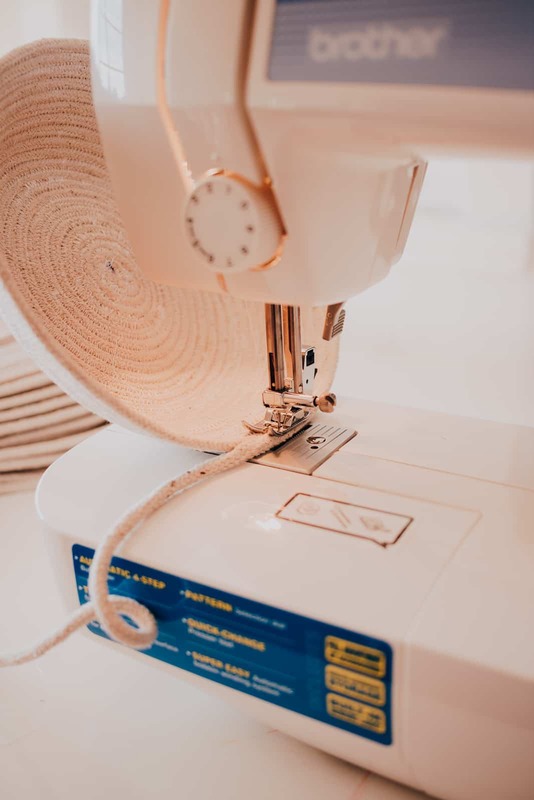 But for me – the sewing machine is easy enough and I think makes them a bit more sturdy to handle. I started off using white thread but ran out and then switched to black and I love the contrast! It got me thinking that you could make these coordinate with your rooms just by switching out the thread. Or use a bunch of different colors for a cool look. I used a zigzag stitch (#4 on my machine). Start by coiling your rope into a tiny circle. This will start to form the base of your baskets. You can put a pin through this and sew it that way but I found it easier to just stick it right under the sewing machine. I sewed back and forth across it to really make sure it’s good and secure. Continue to coil the rope around. The toughest part is in the beginning because it’s so small at first. It gets MUCH easier as it gets bigger. 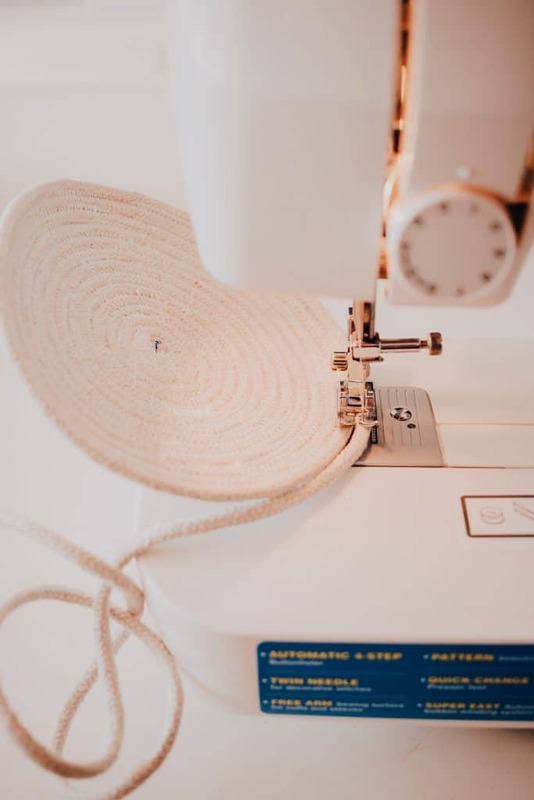 Line up your machine so the middle of the two ropes is fed under the needle. The zigzag will stretch across the two ropes, adjoining them together. More rope coiling! Keep going as big as you want! Tip 1 : The basket will naturally start to round out and curl up as you are sewing. Keep your bottom piece proportionate to the size of your basket. 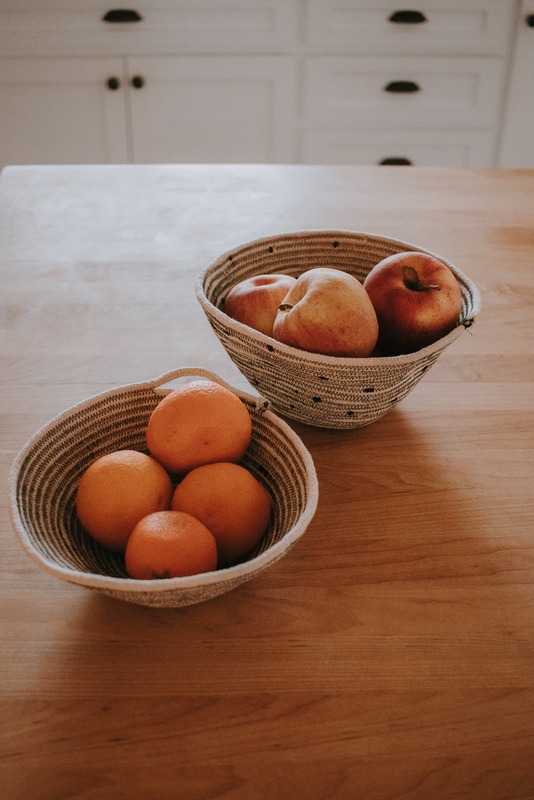 For example – if you want you a lower and wider basket you will need a larger flat base on the bottom. Tip 3 : Periodically switch from a #4 zigzag stitch to a #5 to make little “dots” of thread throughout the basket. 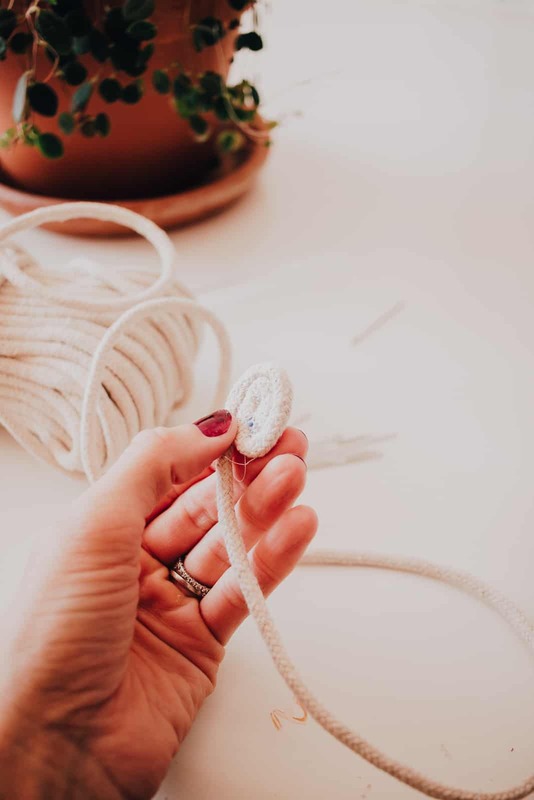 Tip 4 : Make little “handles” but sewing a small hole through two adjacent ropes. 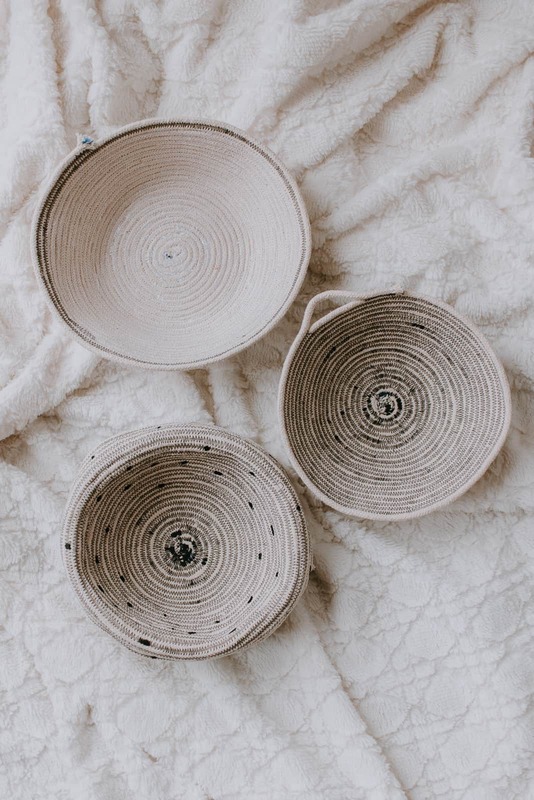 There are several options for finishing your rope basket. At some point it has to end and you will have the end of the rope with no place to go! I simply sewed it as securely as could to the end and left the end a bit frayed. It looks natural and organic that way. You could also make a knot and attach a cute tassel or pom pom. You guys! These things are so cute. 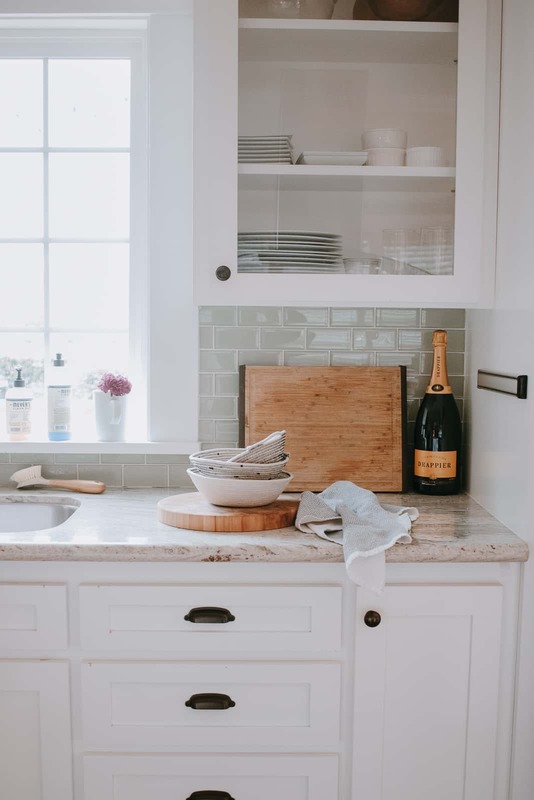 You can use them in the kitchen, your entry way table to hold keys, your linen closet, your bedroom – even in your bathroom cabinets to hold all those little things. You could also use different color cotton cording! Get creative. 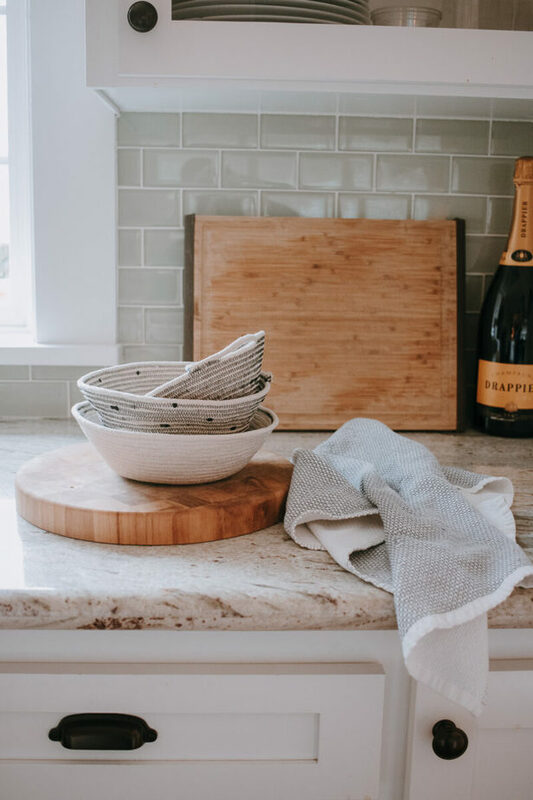 Make a set of nesting bowls and gift them away! 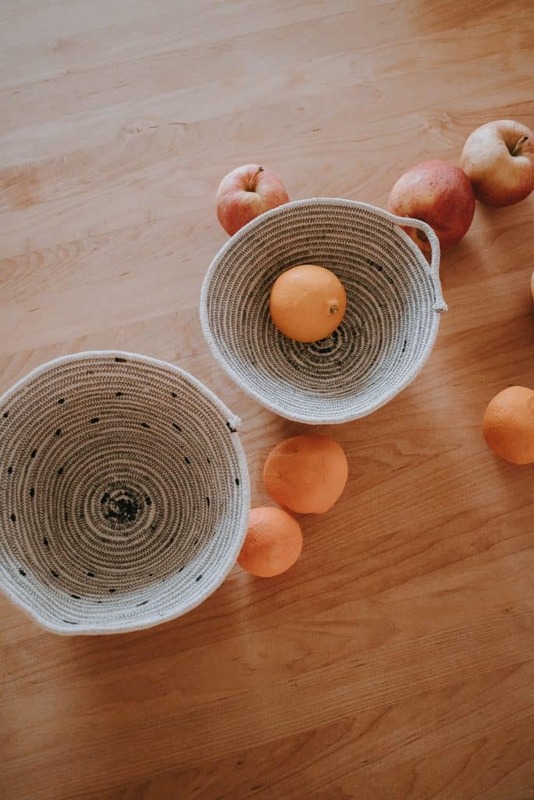 I hope you guys enjoyed this super easy tutorial for diy rope baskets.